We have again created a video with Richard Carlton at FileMaker Training Videos. 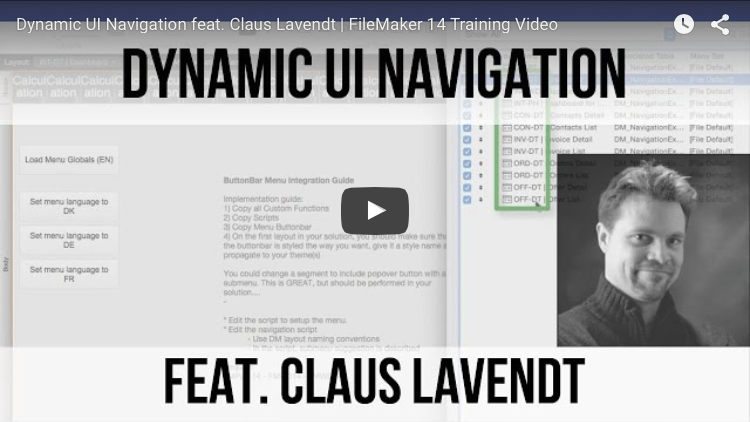 This time, we show how you can create a great dynamic navigation system with the use of the new Button Bar object in FileMaker 14. The idea with this navigation system is that you insert the button bar onto all the layouts in your solution, where you need the navigation. Then, via a simple script, you determinate which buttons should be available at any time. When you need to add another module to your solution, just add 2 values in the script and the navigation will automatically work, without you having to replace the button bar on all layouts. Please give us your feedback on this free technique file and video.